Georgia's early history was marked by competing claims from Spain and Great Britain. It was later added to the American colonies and named after King George II in 1724. It was the last of the original thirteen colonies to be established, and was the fourth to be admitted to the Union on January 2nd, 1788. The Cherokee Indian tribe, a well-advanced and powerful American Indian culture, was established in the northern region of Georgia, as well as eastern Tennessee and the Carolinas. Despite taking their case to the U.S. Supreme Court, the Cherokees were forced to evacuate their ancestral lands by President Andrew Jackson and march to present-day eastern Oklahoma in what became known as the 'trail of tears'. 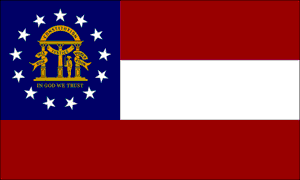 On January 19, 1861, Georgia seceded from the Union, and became a major theater in the Civil War. Late in the war, William Tecumseh Sherman led his army through a large swath of the state, destroying anything in their path and burning much of Atlanta before capturing the port city of Savannah. Georgia was later the last state to be readmitted to the Union. Geographically, the Peach State is the largest state east of the Mississippi in land area, and has more counties than any other state aside from Texas. The northern half of the state is largely mountainous, and the southern is dominated by fertile farmland with ecologically valuable swampland near the border with Florida and along the coast. Georgia has one of the fastest growing populations in the U.S. at a growth rate of some 10.8% over the past five years. The largest city and capital, Atlanta, is the unofficial capital of the Deep South, and home to over half of Georgia's population. The African-American population, at 28.7% according to the 2000 Census, forms a critical part of Georgia's culture, with a burgeoning center of Black professionals and elite in Atlanta (a city which itself is approximately 70% Black). 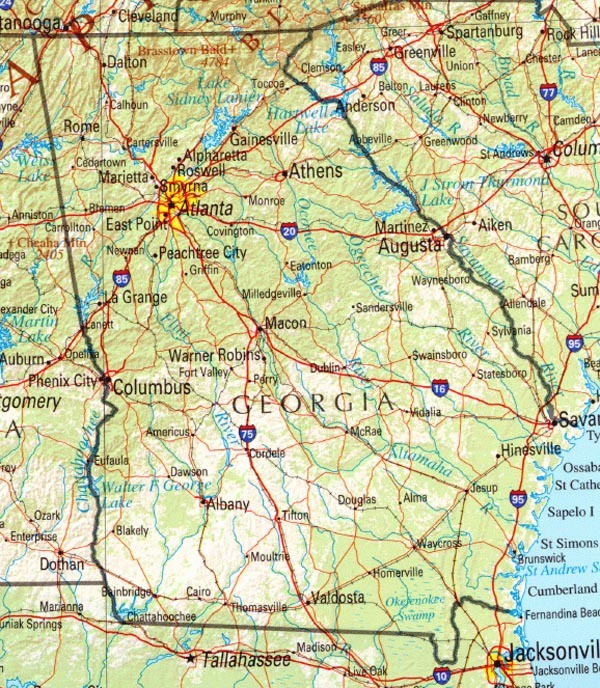 Other important cities include Athens, a music and university center, Augusta, the second largest city in Georgia and home to the world famous Augusta National Golf Club, and Savannah, Georgia's only major port city. Agriculture and tourism make up a large portion of the state's economy, and Coca Cola maintains its corporate headquarters in downtown Atlanta. Politically, Georgia was a long-time Democratic Party bastion, controlling the Governorship, the House and the Senate for over 130 years. Democratic control did not imply strong liberalism however, as the Southern Democrats (known as Dixiecrats) owed much of their political success to their solid support for segregation. Recent history has shown a drastic shift in the political make-up of the state, where Republicans currently control all three branches of Government. George W. Bush won the state in both 2000 and 2004 by wide margins. 11th February 2007	 Your right hand border on this page cuts off vital information for hte reader. Otherwise, very informative.